An effective ad agency has multiple departments and individuals that perform specialized tasks to support the overall efforts of the agency. 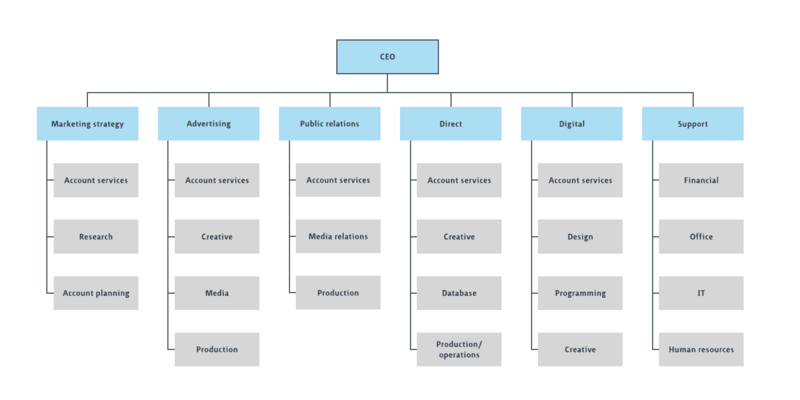 Making an org chart available, such as this ad agency org chart example, can show which resources are at hand and help individuals communicate more effectively across departments. If you'd like to edit this template, simply sign up for a Lucidchart account. Starting with this ad agency org chart template, just drag and drop to add or reposition shapes and double-click shapes to edit the text.